Yesterday, BBC East Midlands Today filmed some of both the rehearsal and concert of Music for Everyone’s Christmas is Coming. During the concert, founder and Artistic Director Angela Kay was presented with the Lady Hilary Groves Prize for her outstanding contribution to music in the community. Peter Lawson, Chair of Making Music, read a wonderful citation of Angela’s achievements. She was warmly applauded by musicians and audience alike for creating opportunities and enjoyment for so many people, and of all ages. Many congratulations, Angela. We have managed to get the video of Angela on East Midlands Today, see if you can spot yourselves! Music for Everyone often goes out into the community and schools to widen participation in music. In partnership with the Theatre Royal and Concert Hall, a new venture, the Workers’ Lunchtime Choir was advertised: a few rehearsals on Tuesdays from 12.30-1.15pm, and a concert. Before the first rehearsal, Alex, MfE’s Assistant Artistic Director, waited a little anxiously. Would anyone come? Does anyone still have a lunch break? But in they came, all 55 of them. Some singers have long enough breaks; others add extra minutes through flexitime. Rehearsals begin with warm up exercises to shake off the morning spent at the desk, shop floor, etc and relax into some singing fun. Yesterday, t he choir rehearsed a variety of pieces, from Gaudete, Christus Natus Est (Remember Steeleye Span?) to Ding Dong Merrily on High and a Gary Barlow number. Their first performance (what an achievement!) will be next Wednesday, 16th December, at 6.45pm in the upstairs foyer of the Royal Concert Hall, before the Halle Orchestra concert. For more photos, see the Music for Everyone Facebook page. 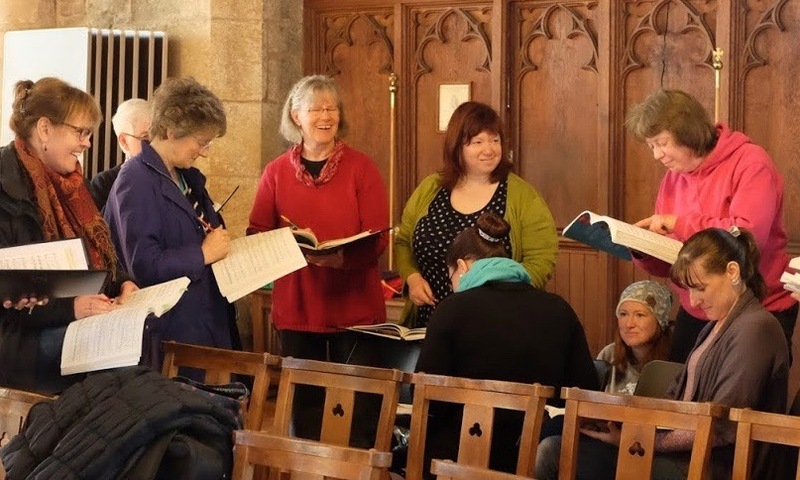 Keep an eye on the Creative Learning tab of the TRCH website for Workers’ Lunchtime Choir dates in 2016. Have a break, have a sing! Saturday proved to be both the windiest and mildest Music for Everyone carol sing we could remember. John, playing the organ, used clothes pegs to keep his book open and secure, while Angela’s hair joined her arms in conducting, only it didn’t quite blow in time with the music! The fairground folk kindly let the roundabouts run with our accompaniment rather than theirs, and they and the Christmas shoppers were entertained with a variety of traditional carols. We sang just for the fun of it, and it seemed to be much appreciated. People stopped to listen or to join in. If you missed it this year, never mind, come next year – outside the Council House, Saturday 3 December, 10.30am. If you’re singing in the Nottingham Festival Chorus February 2016 concert, you have hopefully now received your brown envelope containing a score of Beethoven’s Missa Solemnis, 2 rehearsal CDs and useful information. To borrow enough copies, we have had to use three different editions. If you have been sent a Breitkopf or Novello score, there will be two green sheets in your envelope. If you were lucky enough to receive a Peters score, you won’t need the green sheets. HD: The brown envelope is now in our excited hands. What is the first thing we singers should do having opened it? Angela Kay: Well. The first thing to do is to rub out ALL the pencil markings that have been put in by previous singers. I’d like everyone to do this because as a conductor, it’s pretty annoying when people say, ‘Well in my copy it says this’ or ‘Last time we sang it we did that.’ Those markings were from another choir, another conductor or me at a different time, which isn’t to say that they weren’t right, but because February’s will be a fresh performance. Music is a living organic thing, and research has changed interpretation, so I might well do things differently. AK: For those of you without a Peters score, please, please, please, and I appreciate it’s a bit tedious, use the green sheet and write the Peters letters into your Novello or Breitkopf score. You won’t be able to follow the CD or the rehearsals without doing this. HD: I tend to use a tick. AK: … and something to ensure you don’t come in by mistake when it should be a soloist singing. HD: Mine has crosses in it for that very reason. It would be SO embarrassing. AK: Yes, anything, as long as you know where you need to be on the page, especially as some of it is fast and tricky. Please do it all in pencil as opposed to highlighter pen, which we have actually had. We can’t return those copies to the library and have to buy new ones to replace them. AK: There is (with a modest twinkle in her eye) myself, giving words of wisdom. I go through each movement in more detail than I have done in the past, line by line. I’ve played some of the more difficult bits on the piano and just generally tried to be enthusiastic, because I am, and I hope the singers will be, too. Introductions and solo bits have been cut out. I’ve actually put the difficult bits on at a slower speed but at the right pitch, especially the fugues, so that you can sing along. During the course we’ll have time to look at these tricky bits, and we’re going to have additional sectionals during the rehearsal weekend to help with them. HD: I do have a piano, but I’ve been trying out some piano apps on my iPad. I can pick out the tunes from the comfort of the sofa. AK: (Laughs) And there are rehearsal tracks available online, like at Choralia. HD: And there’s Choraline if folks would like to buy a CD of their part, or download them as mp3 files. AK: Yes, lots of ways to get a good feel for the piece before the sectional rehearsals in January. This weekend, there are three Christmassy Music for Everyone events. Tomorrow morning, SATURDAY 5th December, traditional Carol Singing in the Market Square, 10.30am to 12 noon. The weather is set fair and mild (at the time of writing), so do come along to sing or listen. Tomorrow evening, SATURDAY 5th December, 7.30pm, at St Giles’ Church, Church Drive, West Bridgford, NG2 6AY, Classics for Christmas. The East of England Singers will perform Bach’s sparkling Magnificat with Christmas interpolations, three beautiful Mendelssohn motets for this time of year, Bassano’s rousing Hodie Christus Natus Est, and Vaughan Williams’ gorgeous and familiar Fantasia on Christmas Carols. The New Classical Players will accompany them, and also play Torelli’s wonderful Christmas Concerto. Mulled wine or juice and mince pies will be served during the interval. Tickets available on the door. £11 (Full), £10 (Conc. ), £5.50 (Child/Student), includes refreshments. Our roving reporter interviewed Angela about Beethoven’s Missa Solemnis, which the Nottingham Festival Chorus will be performing in the Albert Hall, Saturday 6th February, 2016. Here is the introduction, more to follow, including some very helpful guidance about learning the work at home, in the sectional rehearsal, and during the course. HD: When did you first sing in a performance of Beethoven’s Missa Solemnis? AK: Well it was in 1978, I think March, with the Nottingham Harmonic Society conducted by Andrew Burnham, in the old Albert Hall Institute. Nearly thirty years ago. HD: Or nearly forty years ago? AK: You’re right. How time flies! HD: Tell us a little about that experience. AK: It was the first time I’d heard the work, I didn’t even know it existed really, and I thought it was fantastic, quite hard. Some bits are really easy and then other bits are absolute killers – fugues, because they’re so quick. There are still about 8 bars I’ve never known anybody sing properly. If you’re an alto, like me, you get to a certain page and you hear, “Can’t sing that bit.” [Laughs] But… with lots of slow practising…! As you can see on my copy [from when I sang it], it has instructions written all over it, and beats in the bar for all the syncopated stuff. Fortunately, lots of it is doubled up in the orchestra. HD: Do you have a favourite movement? HD: What led you to choose this work for the Nottingham Festival Chorus? AK: Well I thought it was about time we did something we could really get our teeth into, and I thought that no one else had done it for years, as far as I can remember. Or did the Bach Soc? Anyway, it will be a wonderful experience.